Published on Saturday, February 23, 2013. 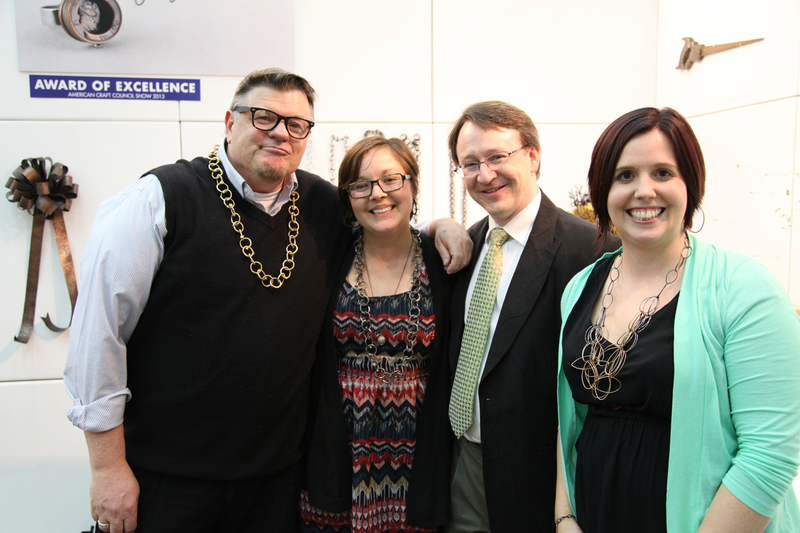 Stacey Lee Webber and the AOE jurors. Reclaimed materials and striking design were themes on Friday afternoon at the ACC Baltimore show, where six artists received Awards of Excellence for their work and savvy displays (of excellent work), and another standout artist received the inaugural Excellence in Wood Award from the Collectors of Wood Art. The AOE jurors were Robert Mintz, chief curator at the Walters Art Museum; Tim Tate, artist and co-founder/director of the Washington Glass School; and Megan Auman, a designer, metalsmith, and entrepreneur who blogs at Designing an MBA. Representing the Collectors of Wood Art were Steve Keeble, Joe Seltzer, Dave Long, and Lynda Smith-Bugge. 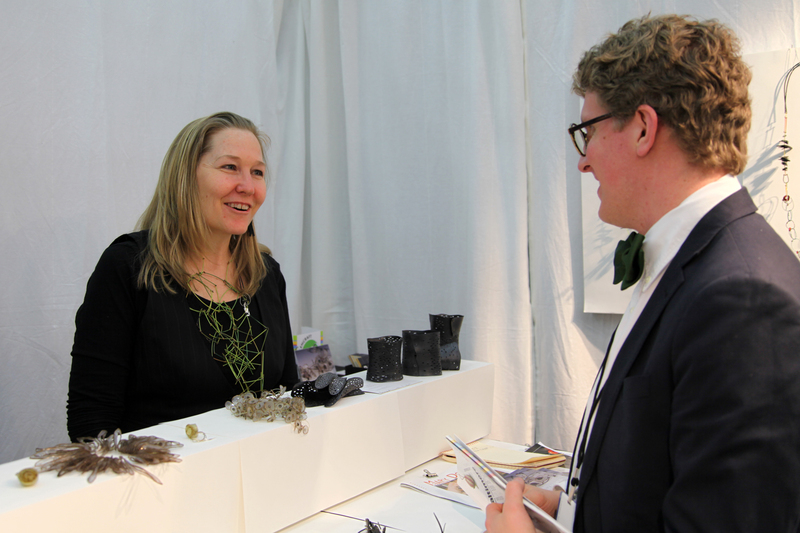 Award of Excellence winner Mary Donald’s work (booth 614) spans jewelry, objects, and installation, and her materials are just as diverse: wood, plastic, fiber, and metal merge with all manner of found and upcycled matter. She transforms bicycle inner tubes, for example, beyond recognition into striking cuffs and earrings. Stephen Gretz, in booth 1218, caught the jurors’ attention with the presentation of his Dovetail planters, earning him an Award of Excellence for booth design. Elegant risers and a backdrop of wood planks in a pipe armature were a perfect complement to the monumental planters, handcrafted of reclaimed old growth redwood. The jurors also had big love for Dustin Harris’ enormous soda-fired pots, as well as their smaller brethren, with their gorgeous, celestial colors and complex patina. 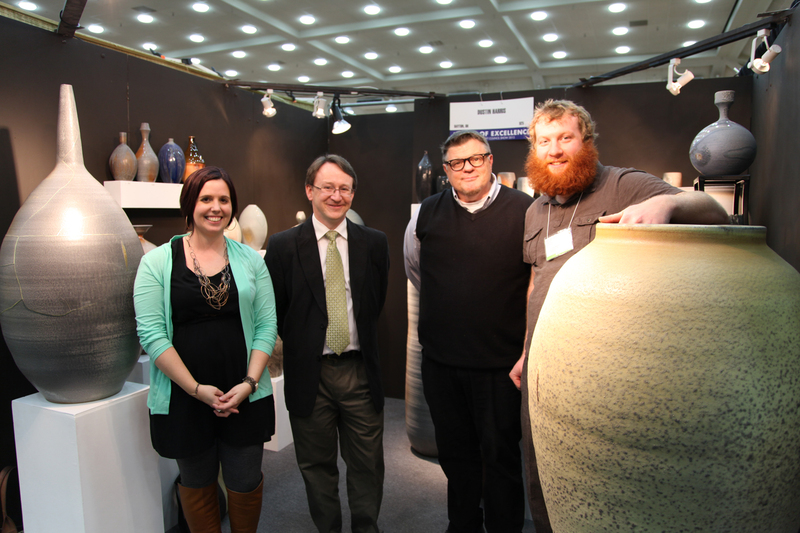 The AOE winner (booth 925) received his BFA from Alfred University in 2004, and in addition to his work as a ceramic artist, is an educator who teaches high school art in Dayton, Ohio. 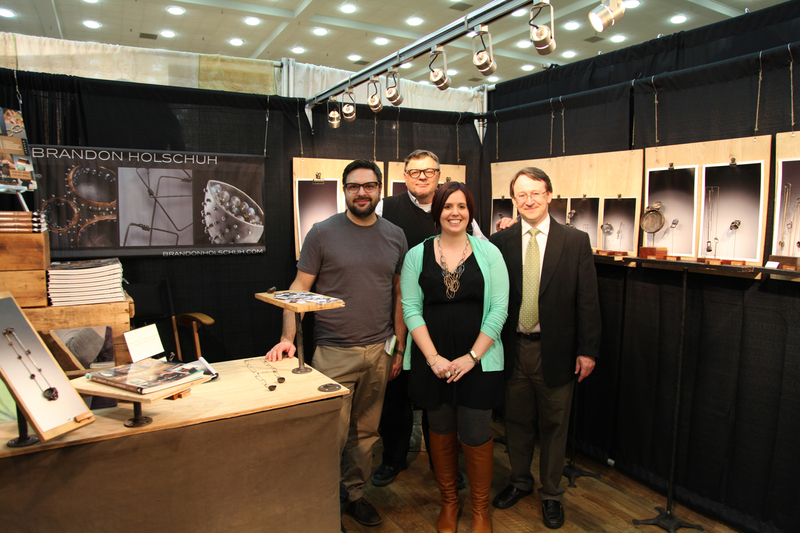 Brandon Holschuh, who won an AOE for his sculptural jewelry this past August in San Francisco, nabbed an AOE for booth design at Baltimore. Auman praised his intense and thoughtful attention to detail. Like his work, in which individual pieces are suspended on custom armatures (serving as sculpture when they’re not being worn), his booth (216) reflects a canny eye for presentation. 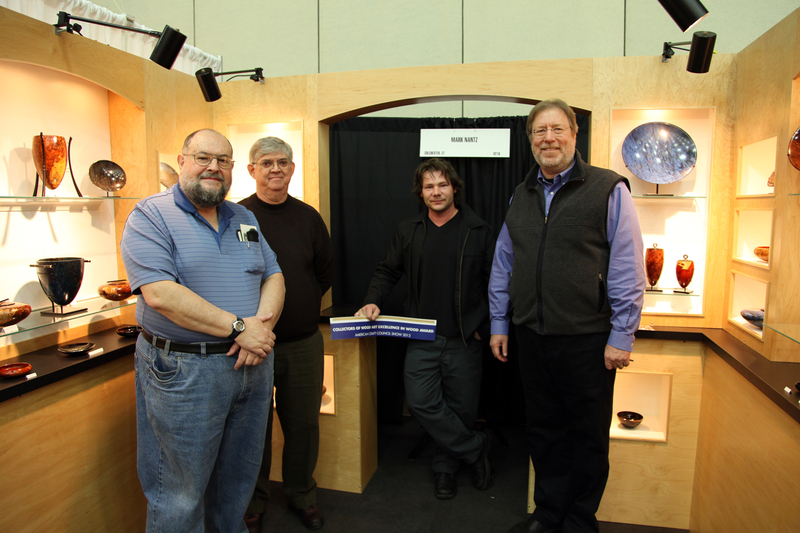 The Collectors of Wood Art chose Mark Nantz (booth 4218) for their inaugural Excellence in Wood Award. Nantz, who makes turned and constructed wood objects, revels in the visual characteristics of his medium, highlighting spectacular grain patterns with incredibly precise craftsmanship and elegant designs, including delicate silver inlay. ACC Education Director Perry A. Price surprises Mary Donald with the news. Dustin Harris and the AOE jurors. The Rustbelt Rebirth team, AOE winners. 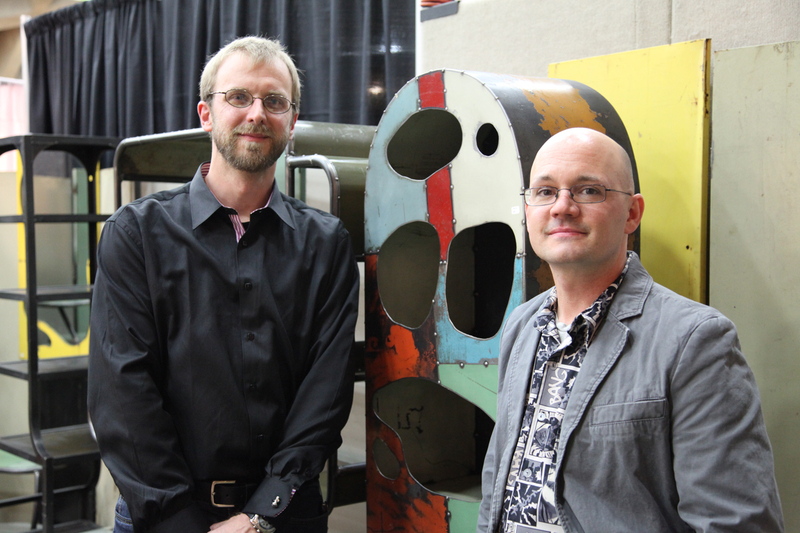 AOE booth design winner Brandon Holschuh and the jurors. Mark Nantz won the inaugural Collectors of Wood Art Excellence in Wood Award. 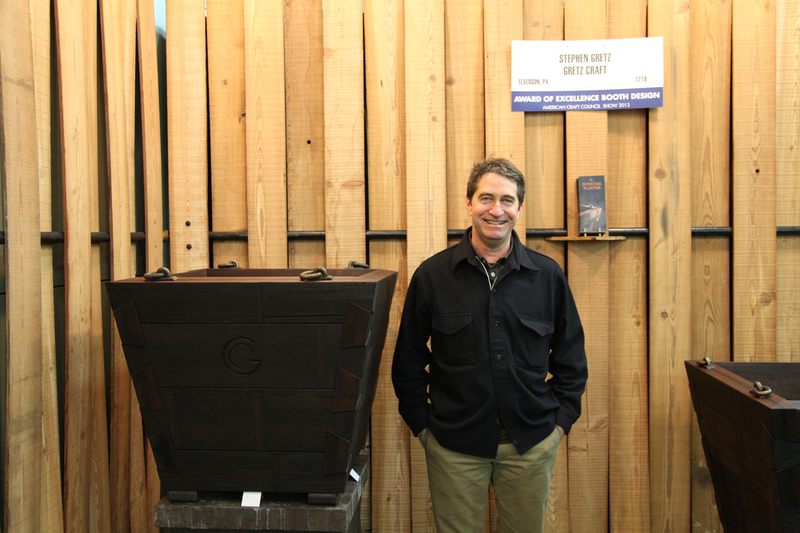 Stephen Gretz, with one of his Dovetail planters, in his award-winning booth.